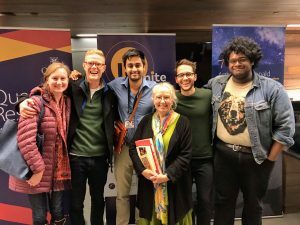 Queen’s University launched a new event, called Ignite, ostensibly designed to demystify academic life and research to a wide public (see also here). Though retired for a year, I was very flattered to be invited to speak about one of my projects, alongside enthusiastic young physics Professor Ken Clark, who arrived at Queen’s just as I left. To my great surprise, members of Meds 2020 and Meds 2021 showed up too, and we celebrated our little reunion together with this photo.